Give your lips a tropical delight with this sweetly scented custom lip balm that moisturizes and softens. Great for gifts shops, trade-shows, gifts and more. Round Compact Customized Mirrors - 2.25"
These compact customized mirrors are imprinted with your logo on the cover and are perfect travel accessories! Brighten up your giveaways with fashion colored promotional sunglasses that are available in solid and translucent colors. It's sunny skies ahead for your logo with these cool rubberized custom sunglasses. Heal chapped lips and protect yourself from the sun with our promotional lip balm and custom sunscreen both containing SPF. Three single use packets are included in this SPF-30 custom sunscreen Everyone needs sunscreen, why not provide a need while exposing your brand at the same time. This little promotional sewing kit in a paper box is a useful travel item. Market your message with this promotional nail file, the perfect manicure tool! Don't use just an everyday lip balm! Moisturize your lips with this unique cube shape custom lip balm that comes in a variety of colors. Show off your style with these Colored Tinted Lenses Rubberized Custom Sunglasses. You choose the arm and lens color that best fits your style. Collapsible Promotional Hand Sanitizer w/ Carabiner - 1 oz. Your recipients will stay germ-free while on the go with this promotional hand sanitizer in a convenient squeeze pouch. Compact Folding Promotional Travel Mirror - 2.75"
A compact folding promotional travel mirror is a great way to get your brand exposed. Full Color Custom Lotion w/Flip Top Lid - 1 oz. This natural formula custom lotion feels great and will make your full color logo glow with health. A promotional lint roller with your logo is exactly what the business professionals want to keep them looking their best. Add your logo to classic custom sunglasses that are available in your choice of translucent color frames. A Promotional Mirror is a unique promotion that reflects well on your message! Spruce up your appearance while on the go with this 2-in-1 custom mirror compact that features a built-in hair brush. Great for hospitals, nursing homes and senior centers. The Promotional Nail Clipper has a larger plastic covering that allows for a more secure grip when using. The Full Color SPF 15 Promotional Lip Balm sticks are a budget-friendly way to build long-lasting exposure for your brand. Perfect for giveaways at outdoor events! These unique promotional sunglasses have a folding feature that makes them a convenient size for storing in bags, pockets or glove boxes. A custom nail file and buffer with a unique design for incredible comfort and control. This basic promotional polisher allows users to shine their shoes while on the go while displaying your full color logo. Kiss up to your customers with this customized lip balm! Guaranteed to be one of the top promos of the year! Add shine and color to your next promotion with this handy purse-bound promotional lip gloss. This custom lip balm stick in a handy neoprene sleeve is a creative way to get visibility for your logo all year long. The unique round container of this well rounded Promotional Lip Balm will make a trendy giveaway for your next event. Custom mints & promotional lip balm packaged together in a double stack custom jar are the perfect combination. Promotional travel kit packed with six bottles for packaging your favorite shampoo, soap and lotions. A Promotional Mini Fan with Breakaway Lanyard attachment. This soothing tinted promotional lip balm is a creative way to get visibility for your logo. 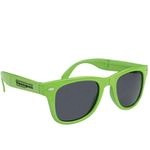 Add a pop of color to your giveaways with promotional sunglasses featuring two-tone colored frames.